Today it is difficult to imagine how dark houses were in the past but it was not until the late 18th and early 19th century that oil lamps were introduced to the home. These early lights burnt colza oil which was made from rapeseed, but paraffin soon superseded this when it was introduced in the 1860s because it was cheaper, lighter and less viscous. The oil was stored in reservoirs (often shaped like classical urns) and was drawn up a wick from this container. 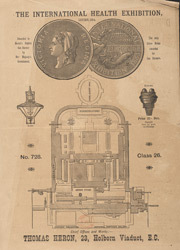 Some lamps like those advertised on this leaflet were duplex burners and had 2 wicks placed close together to produce more light.